Nonetheless, there are also a series of characters that are respectably accomplished. This is the case of Blaine, Ifem’s smart boyfriend, through whom we sharply assess his drivel and pedantry for an excruciating level of perfection. The character of Ifem’s aunt and her corrupt partner are also adequately developed, as is the teenage presence of her cousin, Dike. I also liked the very minor character of Doris who always ended her sentences with a question. Then there are other characters that end up being a little superficial, such is the case with the white man, Curt, whose artificial relationship with Ifem is most unconvincing, although he provides legitimate sociological details, such as when he says, “the problem with cross-cultural relationships is that one spends too much time explaining”. The main character Ifem deserves a special mention here, as she rubs me up the wrong way. What I mean is, that I can’t bring myself to like her not because she is an fake character who has been masterfully constructed, but because I find her oh-so-clever attitude in many parts of the book simply irritating and unbearable. I liked Obinze much more, and I find his story much more interesting than that of the blogger. In fact Americanah doesn’t only tell the story of Ifem, but also of the good-natured Obinze: his journey of suffering in London was the most readable part of the novel for me. It reminded me of my own stay in the capital of the United Kingdom. Life is damn hard in London – where people can be seriously marginalised and even deported. Americanah goes from Ifem’s story to Obinze’s, as well as leaping through time in the form of flashbacks. 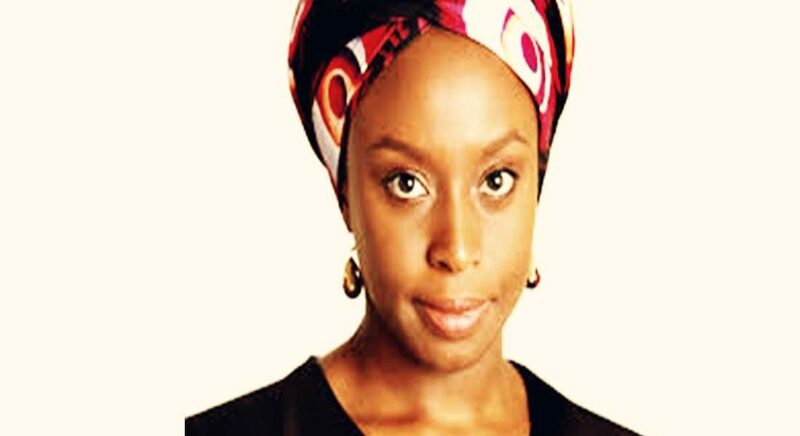 In other words, and as suggested above, Chimamanda Ngozi Adichie gives the impression that she is more a sociologist, a researcher, or an essayist full of great sentences, ingenious ones, intelligent phrases and astute reflections which she tries to fit into a literary structure, but without much success. Despite all of this, the novel survives precisely because what the author tells us is of evident sociological relevance. However, a novel should exhibit much more than merely its social contribution; a high quality of literature is a non-negotiable component. Going back to the racial question (a theme which dominates the novel) I have noted various sections of the novel that were striking to me. For example, the book constantly refers to the race that currently dominates the world, that of the WASP: White Anglo-Saxon Protestant. That is to say, those blonde guys and girls who we see so often in Hollywood, setting society’s standards in a direct or indirect way. It rightly states that both Asians and Africans are invisible in American pop culture. On the other hand, if “all the world” aspired to be like the WASPs (blacks, Asians, and also other whites etc. ), “What would a WASP aspire to be?” as one of the protagonists of the novel questions. In other words, global society remains stratified and today racial interaction still fails to flourish. Another leading character in the novel explains very well that “there is a feeling that in America, blacks and whites work together but don’t play together, meanwhile in Great Britain blacks and whites play together but don’t work together”. Reading this book one discovers the amount of varieties and possibilities that can make up a racial component (defined as phenotype and not a genotype), which is often inextricably linked to power. For example, a wealthy Nigerian man (black) won’t consider himself to be quite black, up to the point that he will be indignant that a Nigerian woman would go out with a black man, even asking, “Why a black man?” In this sense, others might also say that “Oprah isn’t black now, she’s Oprah”. One discovers more characteristics of the black psyche as it were, including the importance women give to their hair. Or the longing to be the only black person in the room to steal the spotlight. It is possible that this “only black person” speaks to his friends in ebonics: a type of slang spoken by many “blacks on the street”. Being black, when travelling, can also change everything. In this respect, the section of the book entitled “Travelling Being Black” is quite interesting (and amusing). Inevitably, race and poverty often go hand in hand. Many times black is the equivalent of poverty or of nouveau riche. For example, it will be said that, “we are citizens of the third world and that is why we like new things, because the best is yet to come, meanwhile the best moment in the West is already in the past and for this reason they have a propensity to be hung-up on this past. Or this other good phrase that reflects the race, money, and power relationship, “the rich don’t care about tribes, but the lower down you go, the more important the tribe becomes”. Continuing with race the book also talks about the trendy-white hypocrisy, “many abolitionists wanted to free the slaves, but they didn’t want the black people living among them”. Or the subtle racism shown in response to controversial texts, where it seems that whites can talk about the issues of race without beating about the bush and be supported by activists because their anger is not a real threat to the establishment. Americanah also makes fun of some whites, accusing them of being a touch “bourgeois” with their unfathomable demands and ailments, such as mental illnesses that would be inexplicable to many blacks. What also crops up is that black police never stop white drivers (on this, let me say that, I have been stopped by black police in Liberia as much as in Papua New Guinea).